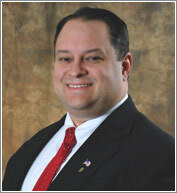 Michael P. McCord was elected to the position of Treasurer in 2016. He serves as the 27th Treasurer of Pinal County. He is originally from Pennsylvania, during his time there he worked as a Paramedic and Director of Operations for an ambulance service in Millcreek Township, Pennsylvania. Mr. McCord graduated from the University of Edinboro and received his B.A. in American Government and Public Administration. In 2006 Mr. McCord relocated to Arizona with his wife Jacquelyn, and worked as a school teacher at a Charter School located in Apache Junction where he taught Middle School Math and American Government. During this time he earned his Master’s degree in Business Administration, and was promoted to Executive Director for the Charter school. Mr. McCord is a member of several community organizations and resides in San Tan Valley with his wife and daughters.